These are the steps for setting up an IMAP device or email client for your QMUL email account. 1. Open your email client that uses the IMAP settings. 2. Enter your Name and QMUL email address. 3. Enter your QMUL Username followed with @qmul.ac.uk (e.g. abc123@qmul.ac.uk). 4. 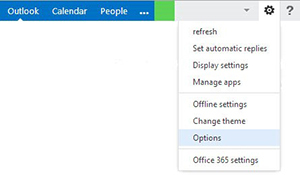 Enter the server/host address as outlook.office365.com. 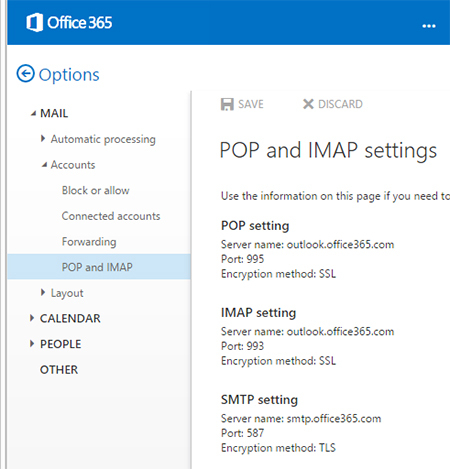 Note: If this doesn’t work, please proceed to the steps below for configuring IMAP for Office 365 using server addresses. 2. Click on the Settings cog at the top right of the screen and then click Options. 3. Under the Accounts tab on the left hand side, click on POP and IMAP. 4. Make a note of the Server name, Port and Encryption method for both the IMAP and SMTP settings. 5. Use this information to configure your email client or device. IMAP is used for your incoming server and SMTP is used for your outgoing server. Note: You will need to enter your QMUL username followed with the @qmul.ac.uk suffix (eg abc123@qmul.ac.uk) when prompted.